Saturday, June 18th, at Quarry Ridge Golf Course in Portland. Lunch served in the clubhouse at 11:30am, shotgun tee time of 1:00pm. Enjoy 18 holes of challenging golf, a putting contest, special prizes for best father-son or father-daughter score in honor of Father’s Day, beverages and buffet, raffle and prizes! The cost for lunch, golf and dinner is $125 per golfer (dinner guests may be added at $35 per person). Register by May 15th and be entered in a raffle for a foursome at the TPC River Highlands course. All reservations for the tournament will be accepted through June 10th. 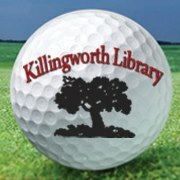 Make your checks out to KLA and mail them to: Shelly Cumpstone, KLA Golf Tournament, PO Box 725, Killingworth, CT 06419. For information and reservations, call Shelly at 860-391-2747.